Cork has been the principal closure for wine bottles since the 17th century, but screw top wine bottles are becoming popular in the 21st century. Cork itself is processed from the bark of the cork tree, which is a type of oak and is found in the western Mediterranean area in Portugal, Spain and North Africa. The majority of the world's bottle-stopping cork comes from Portugal, where it is a primary export and a key component of the nation's economy. 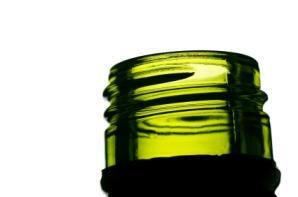 Why are wine bottle closures important? Because they are needed to seal the bottle and protect the wine from damaging oxygen. Cork has served its purpose admirably for several centuries. But corks are imperfect and fallible. They can crumble, they can break, they can leak, and they can create an evil phenomenon, corked wine, which can taint a wine to a point of being unpalatable if not downright hold your nose nasty. There's nothing more disconcerting than to taste a highly-rated, expensive wine at a restaurant and then have a serious discussion with the wine steward about it being corked. The wine industry has begun seeking alternative bottle closures to improve quality and prevent costly financial losses due to bad corks. One alternative that has made strong inroads to usurping the organic cork is screw top wine bottles. There are some estimates that about one bottle in a case of twelve suffers from cork taint. Corked wine occurs when trichloroanisole (TCA), a compound that forms when a chlorine bleaching agent used in the manufacture of corks, reacts with mold already present in the cork. TCA can also occur in the pipes, drains, and casks at a winery, but when a wine is corked then the usual suspect is the cork. The frequency of TCA's presence in corks in recent years can most likely be attributed to the increased volume of wine sold and the decline in cork quality to meet demand. This increased frequency has caused some winemakers to look for other stopper solutions. There are several alternatives to cork that have been developed, including a synthetic cork. These plastic plugs are an easy alternative choice for wineries because they do not have to change their corking equipment to use them. However, consumers criticize these plastic stoppers because they pass on a slight plastic taint to the wine and they are a workout to remove. In fact, I've often thought a jackhammer might be more effective in getting these stubborn plastic corks to budge. It's a decent solution for low-end wines, but for aging wines they falter. Among the alternatives with potential are screw top wine bottles. These screw caps are not new and have been around for several decades, but they have never made significant headway against cork. But as both winemakers and consumers get fed up with cork and its increasing problems, momentum swings towards screw top wine bottles. These screw cap closures have an aluminum alloy casing as an outer layer with an expanded polyethylene liner. As the cap is compressed, the polyethylene liner compresses and creates an airtight seal, which is exactly what the cork does. The leading aluminum screw cap closure is the Stelvin® capsule from a French company, Alcan Packaging. These Stelvin capsules have the largest market share for screwcaps. The biggest push behind the switch from cork has probably come from outside the U.S., including France, Australia and New Zealand. The Clare Valley in Southern Australia is known for its Riesling wine. In 2000, a consortium of Clare Valley winemakers came together and made a commitment to the Stelvin screw caps by making an order for 250,000 bottles to Pechiney (later integrated under the Alcan Group) in France. This busted up the logjam and by the year 2004, over 200 million bottles in Australia had screw caps. New Zealand followed the Australian example and by 2004 over 70 percent of the Kiwis' wines were using screwcaps. Now, it's almost impossible to find a New Zealand wine with regular cork. The screw turns slowly in the United States, but it is turning. Several wineries have adopted the Stelvin screw caps and the number of converts is increasing. Napa Valley's PlumpJack Winery adopted screwcaps and uses them with success, even on their high-end Oakville Estate Cabernet Sauvignon. California's wine maverick, Randall Grahm of Santa Cruz's Bonny Doon swears by Stelvin closures, in fact, he exuberantly evangelizes and celebrates its defeat of corkiness. Washington's Hogue Cellars has done its own testing and found that screwcaps preserve the wine's freshness and eliminate cork taint. They have begun using screwcaps on their Hogue line and will introduce it to other lines as customers accept the non-cork wines. So, there is a slow and steady groundswell of support for the screwcap alternative. How far it will get is yet to be determined. If a screwcap is so superior to cork, why isn't there a rush of winemakers to switch? Well, let's just say that winemakers aren't lemmings, they don't automatically follow each other. There are pros and cons that they have to consider before going over the cliff. The following are a few quick points for both sides. Convenient and easy to remove with a quick twist. And they are resealable. Corkscrews are irrelevant. Civil engineering skills are not required to open a bottle. There's more space in the kitchen drawers. Stelvin capsules are available with two separate liners. One liner includes a multi-layered polyethylene liner that provides a tight seal but allows some oxygen penetration. This is best for aging wines less than five years. A second liner includes a tin layer mixed with the expandable polyethylene liner that is impermeable. This screwcap is designed for longer-term aging requirements. Any oxygen that is needed has been trapped in the bottle's neck to help the wine mature with grace and character. Works with both white and red wines. Preserves bouquet, fruitiness, character of the wine, and improves quality consistency. Wine bottles can be stored upright or on their sides. No cork bits floating in the glass or getting stuck in one's teeth. Eliminates the ceremonial tradition of removing the cork. Puts sommeliers out of work and gives waitpersons more free time. No pop with a screwcap. No need to convert capital equipment for screwcap bottling line, which most small producers cannot afford. It would negatively effect the economies of cork-producing countries on the Iberian Peninsula and North Africa, particularly Portugal. Corks are required for aging wine. Screw top wine bottles are fine for low-grade white and red wines but red wines will not age as well long-term without corks. Small amounts of oxygen are needed to penetrate the bottle to help the wine attain its potential. Imperfect corks do that. Seemingly screwcaps present a viable alternative to cork with many advantages. However, traditional perception molds are tough to break. Consumers will be the driving force for major change in the wine industry. Too many people equate wines with screwcaps as being jug wine-inferior, lower quality, and not for aging. They may be fine for $10 bottle of Chardonnay but not for that cult wine from Napa Valley. That argument is weak because the majority of wine produced and consumed is destined to be bought and drunk upon the wine's release anyway, usually within two to five years. There are anecdotal claims that there are differences between a wine aged with cork and with screwcap but these are subtle, not backed by empirical evidence, and not always in favor of the cork either. The question of aging viability for screwcaps will not be answered to everyone's satisfaction until significant tests have been made, and as you probably guess, those take time. In the meantime, supporters for screwcaps continue to increase. And while most people concede that corks will never be joining the Dodo bird, many wineries are introducing screwcaps on some of their lines.